Calling all bird lovers! 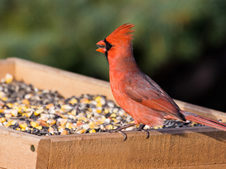 Pick up your wild bird seed at Farmers Coop and Noah’s Pets. We carry a great selection of wild bird feed including black oil sunflower and our very own Farmers Coop Wild Bird Blend. Black Oil Sunflower Seeds – When compared to striped sunflower seeds, black oil seeds are meatier and have a higher oil content, giving birds more nutrition and calories in every bite. Black oil seeds also have thinner shells, making them easier for small birds to crack. Farmers Coop Wild Bird Blend – Now available at all our stores. Birds love this special blend and you’ll love the price. Our Wild Bird Blend is available in two sizes, 25# and 50# bags. Pick up a bag or two today. Feeding wild birds in the winter is important as food sources for birds slow in the winter. Read our proven tips and techniques to help you quickly enjoy beautiful wild birds found around your yard. Stop by your local Farmer’s Coop and Noah’s Pets for Wild Delight, Kaylor of Colorado and Farmer’s Coop Wild Bird Blend seed mixes, assorted bird treats, and bird feeders. This entry was posted on Monday, October 22nd, 2018 at 12:01 pm	and is filed under Bird, News & Updates. You can follow any responses to this entry through the RSS 2.0 feed. Both comments and pings are currently closed.